The Asus PG349Q is an upgraded replacement for the very popular PG348Q which has an excellent performing 3440 x 1440 screen with G-Sync. The brand isn’t shy when it comes to releasing slightly improved variants of their best-selling gaming variants such as the PG278QR which replaced the PG278Q and the PG279QZ for the PG279Q. The Asus PG349Q’s predecessor almost dominated the 100Hz category, but it’s interesting to see how this new model competes in a higher tier. The Asus PG349Q adopts an identical aesthetic from its predecessor composed of the ROG second generation helix stand and a cabinet with a matte gray finish. The monitor looks the same, but there are a few changes which we know many will like on the device. The face doesn’t have bezels, but the dual stage design still incurs panel borders which are reasonable against the screen’s massive size. The rear panel of the frame still has the cybernetic pattern embedded into the thick plastic so the Asus PG349Q doesn’t steer too far from the PG348Q. 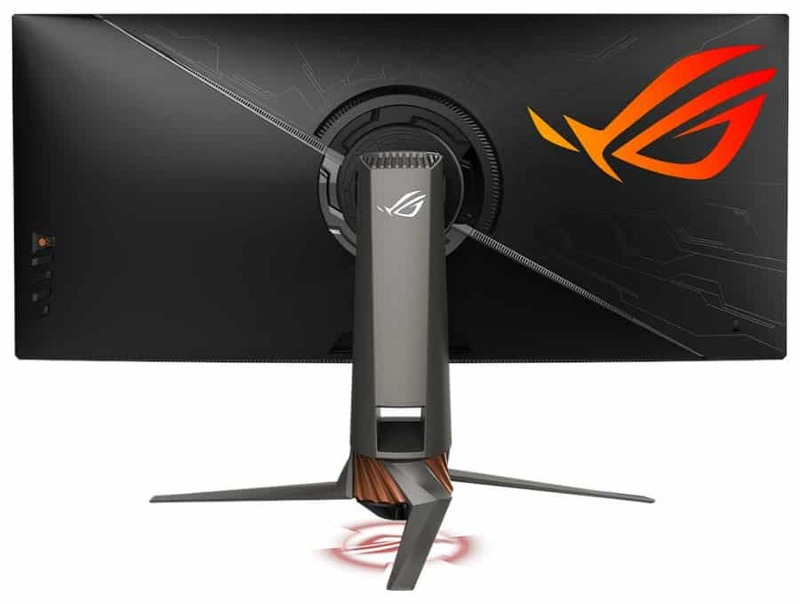 However, there is a large ROG eye logo at the upper corner which has RGB LEDs that work with Asus Aura Sync. This add-on doesn’t boost FPS like many enthusiasts joke about, but it’s nice to have for matching aesthetics and as an active bias light for eye safety. Another important update on the Asus PG349Q is it now sports a sharper 1900r curvature due to the new LG panel used. This upgrade makes the display more aggressive with the corners closer to the face for better immersive effects. It’s also worth noting that some find sharper curves to have a distorting effect on the image, but it shouldn’t affect gamers who will enjoy the engrossing properties of the monitor. We also love that Asus uses a joystick for OSD control on most, if not all of their gaming monitors for convenience. The gadget is accompanied by hotkeys which activate the GamePlus menus along with a power button at the very end. But to be honest, Asus could have hooked up their loyal fans with a remote for a monitor as premium as this to add more value to a refreshed product. 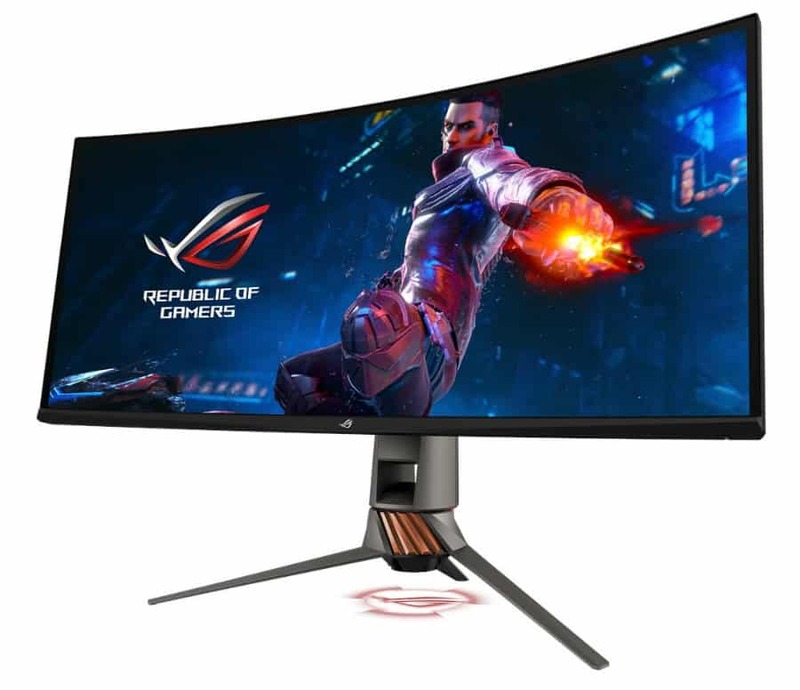 The Asus PG349Q is a G-Sync monitor, so it has limited connectivity options due to the restrictions induced by the proprietary FPGA unit installed with the control board. The panel only includes DisplayPort 1.2 and HDMI 1.4 for video inputs along with a complement of three USB 3.0 ports for accessories. We were expecting newer standards such as DP 1.4 or even HDMI 2.0, but this model isn’t HDR compatible so it comes with the vanilla G-Sync controller. One of the most distinctive features of the Asus PG349Q is its helix stand which has a powder-coated Armor Titanium finish with Plasma Copper details. You can tilt, swivel, and adjust the height of the display, but pivoting is left out since it’s useless for a curved ultrawide. This mechanism is one of the hardest to remove in our experience, but you need to go through it if you want to use VESA mounting. The bottom of the helix conceals a red LED projector with a ROG eye filter for additional ambient light. We think this will clash with the one at the rear, so users will probably turn it off during use. The Asus PG349Q package manages to sneak in a pair of 2-Watt speakers, but we already know from the specs that it won’t be suitable for gaming. The Asus PG349Q sports a 34-inch IPS panel with a 3440 x 1440 resolution, an upgraded 120Hz refresh rate, and 5ms response time. This new variant isn’t HDR-capable as dictated by the 300c cd/m2 backlight and the 1000:1 contrast ratio. Asus used an LG panel this time which you can find on similar models such as the Acer X34P which is actually a 60Hz native module which easily overclocks to 120Hz with only a few clicks. 34-inch ultrawides are best enjoyed with a quad HD or 3440 x 1440 resolution since it provides a more balanced look. 2560 x 1080 models like the Alienware AW3418HW have higher refresh rates and are easier to maximize, but the images they put out look softer and less detailed. Take note that you need a top-end card to maximize a 120Hz 3440 x 1440 combination, but G-Sync will take care of you if your frames drop. The Asus PG349Q supports true 8-bit color which means it should be more accurate and vibrant than a unit that uses dithering. The outgoing Asu PG348Q did an excellent job at this aspect and it is considered as one of the go-to choices for those who dabble in editing other than gaming. We’re hoping the new model shares or exceeds that fantastic characteristic, unlike the pG279QZ which was less accurate than the older model. The Asus PG349Q is a G-Sync monitor which makes it a perfect pair for the latest and most powerful Nvidia RTX cards in the market. Frame drops will still happen even if you have a top-end GPU or two, so its best to have a fully-functional adaptive sync solution on hand. Input lag for this monitor shouldn’t change much, but we are hoping for lower latency and better motion handling. We are looking forward to the Asus PG349Q to see how it stacks up against the Alienware AW3418DW which performs fantastically and is sold at a discount. The additions on the monitor are worth considering, but we know many are waiting for the 200Hz HDR variants such as the PG35VQ. If you are upgrading soon, we recommend waiting for this model to broaden your top picks list. The Asus PG349Q isn’t available as of this writing, but we’re expecting prices and pre-order options to show up soon. Keep checking the links in this page or you can also visit the official product page for this exciting gaming monitor.